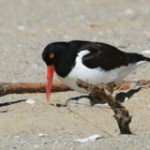 The American Oystercatcher is a colorful bird and easy to spot along New England’s shorelines and marshes from March through September where they come to nest and raise their young. 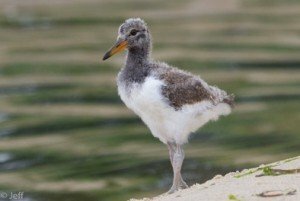 The American Oystercatcher is protected under the Migratory Bird Treaty Act. Currently, populations are increasing in the Northeast Atlantic coastal states and decreasing or stable in the Southeastern Atlantic coastal states. American Oystercatchers are found along the Atlantic Coast, but typically only occur in New England during the breeding and migration season (March-Early September). They can be seen year round South of Maryland. Diet: oysters, clams, barnacles, starfish, crabs, jellyfish, limpets, chitons, marine worms and other invertebrates. Oystercatchers use their long razor like bill to open bivalves and find buried marine worms. Predators: Raptors (hawks, falcons, and owls), coyotes, fox, cats and dogs can prey upon adults or chicks. Eggs are vulnerable to raccoons, skunks, gulls, crows, rats, coyote, and fox. Nests: A shallow depression or scrape that are often lined with shells and located on the higher parts of sandy or rocky beaches and marshes. They lay 2-3 speckled eggs that look like rocks, which helps camouflage them from predators. Incubation lasts 25-28 days and both parents participate. Chicks: The chicks can run within 24 hours of hatching, but it takes up to 60 days for their beaks to become strong enough to pry open bivalves. Thus, they rely on their parents to feed them during the first 3 to 4 weeks of their life. 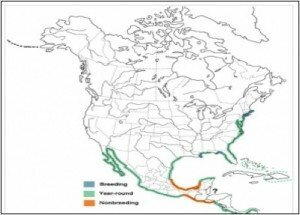 At 35 days, the chicks are considered fledged (able to fly), but most stay with their parents through migration. 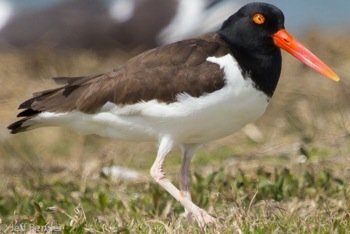 Oystercatchers are VERY sensitive to disturbance from humans and dogs. Be aware of posted nesting areas, and walk your dog away from nesting areas. Oystercatchers become frantic and loud when you are disturbing their chicks. Be aware of this behavior and create a good buffer between you and the birds if you encounter a distressed adult. Disturbing adults from their young or nest may leave chicks and eggs vulnerable to predation or exposure. A little bit of knowledge goes a long way. 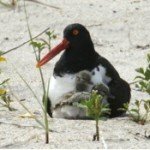 Share what you have learned about this unique bird with others, and help us protect these beach-nesting birds. Carry in Carry out. Don’t leave any food scraps on the beach. 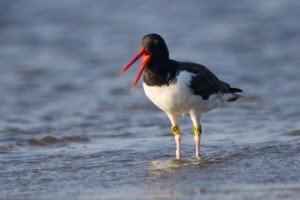 They will attract predators (crows, gulls, skunks, rats, and raccoons), which brings them in close contact with nesting shorebirds.